As of 2011 there were over 700,000 Nepali workers in the Middle East, and this number has since risen, with 400,000 living and working in Qatar alone. Nepal and the Philippines are amongst the countries most dependent on remittances. However, that coupled with a lack of proper governance renders Nepalese migrants extremely vulnerable, while in the Philippines it has given them a collective voice. The dehumanisation of low income migrant workers is often justified or brushed aside based on this argument. One part of that argument is partly true, the other is completely false. In fact, one cannot be farther off the mark. When they migrate for better income, they also face isolation, discrimination, and harsh living and working environments. Low-income Nepalese workers migrate to the Gulf because they earn more and their savings potential is higher. However, their life is not better. There is a broad line that separates economic needs (paying school fees, building a house, accumulating capital for a business) from quality of life (abundant supply of fresh produce, close knit families, supportive community, little houses nested in the Himalayan hills and valleys). The life here is in stark contrast to the one lower-income migrants lead in the Gulf states. Home is community and well-being; a strong support system that doesn't isolate based on gender; a quality of life that is natural to the geo-location. When they migrate for better income, they also face isolation, discrimination, and harsh living and working environments. Which begs the question: does money equate wealth? The human capital deficit in the GCC is poverty of sorts too. Yet, migrant workers continue to be dehumanised because there is little cognisance of what and whom workers leave behind to build the economies of countries that don't have enough manpower to be self-sufficient. A lack of respect for that human capital both in cash-strapped countries of origin and flush countries of destination leads to desperation and exploitation. 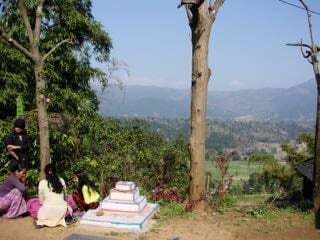 We drive three hours out of Kathmandu to the Tanahun district and pull up by the road side. The car can’t go any further. A 20 minute walk uphill leads to the village of Yampaphant. Single-roomed houses, many with corrugated roofs, nestle on the hill-face. Each has its own kitchen garden, cattle shed and a tiny toilet. A tap by the garden serves as a wash area. Some houses are brighter, bigger; some cattle sheds have more cows than others; few homes also have a poultry farm. Affluence is determined by the livestock one owns. That affluence more often than not comes from remittances. The milk is the tastiest I’ve had. The yoghurt creamy and prepared daily. The cattle provide manure for the organic kitchen gardens, and fresh cauliflower and greens are sold to the middle man too. The food is so wholesome, one wonders how they could ever survive the onslaught of processed food they receive abroad. At dawn, the dirt roads are busiest. Children in smart uniforms rush to catch the bus to the ‘Montessori’, a term used loosely to define private English medium schools. Fresh produce from the kitchen garden, eggs, poultry and milk from cattle is taken to the middleman by the bus stop on the highway. The farmers are aware that what they receive is not even half of what the final market price will be. They have no other means of reaching the consumer. 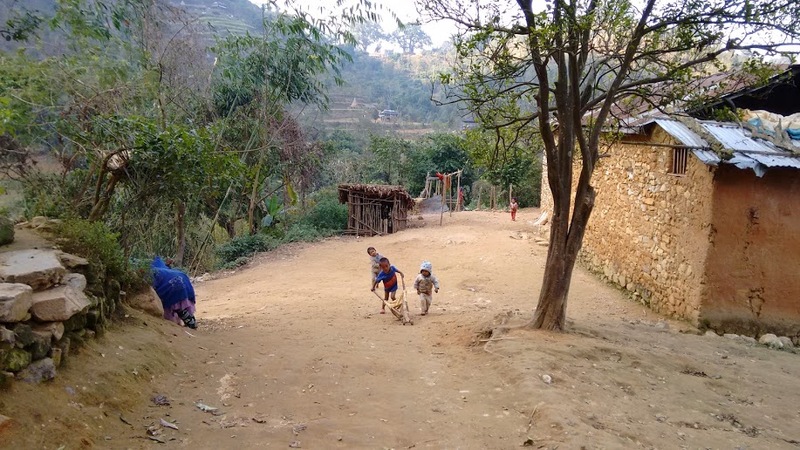 Fresh food, a close-knit community and an unpolluted environment are the staples in rural Nepal from where a majority of the migrant workers in the Gulf hail. 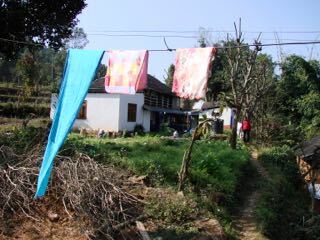 Somprasad's property on the hills include a kitchen garden, cattle shed and some poultry. A returnee, his career now revolves around educating other migrants. 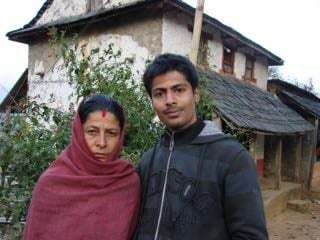 Shriram with his mother. His potential remittances will vastly improve his family's economic status. He is not quite aware how his life and lifestyle would change in the Gulf. Unlike the isolation lower-income migrants face in countries of employment in the Gulf, in Nepal they live in communities with better gender parity and strong support mechanism. The Nepali government has invested little in the entrepreneurial dreams of its citizens. Agriculture accounts for over 70% of its economic activities, yet farmlands are being abandoned for what are seen as lucrative offers in the GCC and Malaysia. The Government does little to correct this. Somprasad Lamichane and his family of returning migrants play host. His father spent several years in Doha in the 1990s, his brother spent a couple of years in Qatar too. Somprasad lived in Saudi Arabia for five years. Though young, he is also the ‘big brother’; the one the villagers turn to for advise on migration and contracts, on starting businesses and finding sustainable income once they return from their foreign employment. His is the story that most hopeful migrants aspire for. But Yampaphant has some dire stories as well. Every household in this tiny village has someone working in the Gulf, or a returnee or someone preparing to go. Somprasad has managed to organise a co-operative of sorts for the cattle farmers, including his brother. About 10-12 of them sell milk collectively, ensuring better rates. Still, it’s just one small step. There are plans to expand the co-operative, setting up subsidiary cottage industries to produce dairy products. Even the best-laid plans need governmental and financial support, both of which are in short supply. So labour migration is seen as the best course of action. Shriram Amgain (26) has a Bachelor’s degree in Business Science. He is now going to Bahrain. Shriram walks me through his village. Animated and full of plans, he says going abroad was not his Plan A. His words, entirely. He brushes off my attempts at speaking in Hindi, preferring to speak in English. He has paid NPR50500 (US$500) for medical evaluations and will pay another NPR100,000 (US$1000) once he receives the visa. All of this has been borrowed from family and friends in the village, in addition to debts he has already incurred. Brother is Som, more a term of respect than consanguinity. That money being the cash he needs to pay off debts and build a business. He is upbeat. Foreign employment is the panacea to all his economic woes. It seems cruel to point out that his savings estimate is way too ambitious. It seems crueller to let him believe in it. I keep silent. So does Somprasad. We continue walking through small villages, through hilly roads and picturesque ponds, all looking out to the snow-topped mountain ranges. Som and Shriram take turns pointing out several brightly painted houses. “Remittance house.” It’s a refrain one hears a lot. Any sign of affluence has a remittance prefix. It’s that prefix that is the carrot at the end of the stick. Next: Returnees' dreams. Some Interrupted. Previous [Stories of Origin] Returnees’ Dreams. Some Interrupted.